Dr. Nandan Shah received his medical degree from University of Illinois in Chicago. He completed his Orthopedic Surgery residency at Michigan State University affiliated McLaren­-Flint program in Michigan. He then went on to work in Chicago, where his practice focused on general orthopedic surgery and adult reconstruction. 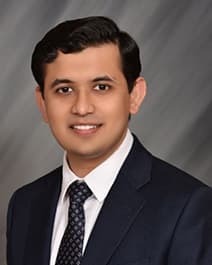 Dr. Shah decided to seek additional training in Spine Surgery, and completed his fellowship at William Beaumont Hospital in Royal Oak, Michigan. Dr. Shah likes to focus on well established, minimally invasive and fusion sparing techniques that allow for quick recovery. He encourages his patients to exhaust all conservative treatment options before considering surgery.